Community School student Geneva Lewis (violin) has been named a Music Finalist in the 2015 YoungArts Awards! Geneva, originally from Auckland, New Zealand, is a merit scholarship student at the Colburn Community School of Performing Arts where she studies violin with Aimée Kreston, studies music theory with Kathy Sawada, and plays in the Honors String Quartet coached by Aimée Kreston. 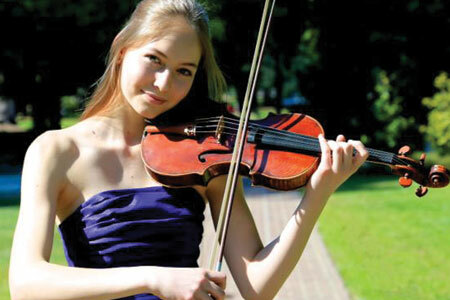 She made her orchestral debut at age 11, and has since matured into an exceptional violinist. Geneva’s powerful performances have awarded her first-prize wins in numerous competitions, including the Brentwood Concerto Competition, Parness Concerto Competition, Southern California Junior Bach Festival Complete Works Audition, and The American Protégé International Piano and Strings Competition. Geneva was selected as one of the world's top 20 young violinists in the Menuhin International Violin Competition. She was presented with the ‘Discovery Prize’ in the Young Musicians Foundation Debut Concerto Competition and won the Doublestop Foundation's "Artist In You" Instrument Loan Competition. Geneva has twice reached the semi-finals of the Fischoff National Chamber Music Competition, and has performed with Junior Chamber Music on tour at such venues as the Mozarteum in Salzburg and the St. Petersburg Concert Hall of the Union of Composers in Russia. Geneva is a JCM Debut Artist and a member of Incendium Quartet.